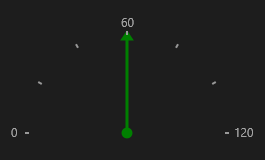 The ArrowGaugeIndicator represents a specific value on the gauge scale as an arrow that points to this value. Its visual representation consists of an arrow head, an arrow shaft and a circular arrow tail. The Arrow Indicator has one unique property plus several inherited properties. ArrowGaugeIndicator class inherits from the BarGaugeIndicator class - See the inherited properties. ArrowTailRadius (double): Gets or sets the radius of the arrow tail.